Born as the only child into a humble family in the Russian town of Khabarovsk (Siberia), in the late 60’s her Liana’s life in Communist Russia was challenging. Hardship on every level was a daily norm for everyone. Most of the time the main tasks for a small child at that time were to survive, study hard in order to work hard in order to survive, whilst struggling with poverty, lack of medications and sufficient infrastructure, despair, domestic violence and harsh climate. However, despite of her tough childhood Liana always loved helping people and animals, and also knew she had a God given gift of healing with her hands. This passion led her to become a doctor, she started her study at the age of 16. After graduating as a Medical Doctor at 22, she continued her studies to become a qualified facial reconstruction surgeon at 25. ‘Being a very successful maxillofacial surgeon in one of Russia’s biggest university hospitals meant that I had not only a big name and big expectations, but I also had a very big EGO!’ Liana says. ‘At that time I thought it was my Dharma, my destiny, to be a top level doctor and surgeon, and that I would do this for the rest of my life’. At the age of 23, at a cold, dark and rainy night Liana got into a terrible car accident, leaving her with injuries in her brain,spinal cord, liver and other internal organs and neck. She was unable to walk. At that time, Liana already had a small child, and being paralyzed, she was unable to take care of herself and her daughter. Miraculously, 2 months after the accident, a small Korean man came into her life. ‘Like an angel he saved me. Using acupuncture needles, physiotherapy and his magical skills, coupled with my willpower, he helped me to get back on my feet, much to the surprise of the doctors who had just said I would never walk again’, recalls Dr. Liana. It was back then when she felt guided onto the path of Holistic Medicine, so she started taking private lessons of acupuncture. In 1998 Liana moved to Belgium to work at the University Hospital in Gent where she continued to study acupuncture for another 3 years. It was a very intense and busy time when she did not have time to look after herself. Needless to say, she soon was burnt out. Another huge block.A simple morning shower took her 1.5 hours and all her energy. She had to sit in a chair – just to wash herself. She was forced to take 6-months medical leave to heal and regain a reasonable balance. Chinese herbs and continuing Acupuncture helped a lot. Without that she would probably follow the common path of Western Medicine with a ‘diet’ full of antidepressants, calming pills, sleeping pills and so on. They would probably turn her into a zombie. ‘So, at that time I believed in just one thing: I will recover. I have a strong mind and a strong willpower. I believed in the power of Holistic medicine and knew I would make it through. It took me a couple of months to recover and it gave me many very powerful life lessons’, says Liana. Through all these life challenges, she constantly studied. She learned how to appreciate and enjoy every moment of her life, happy just to be alive, even to do nothing more than enjoy nature and stillness. She found pleasure in very basic activities, like dancing, painting and singing. In 2003, she decided to become a full-time Holistic Doctor, combining Western Medicine and Chinese Medicine and she finally took a leap from Allopathic to Holistic Natural Wellness. She courageously left the hospital to set up her own acupuncture practice. Her zest for learning remained and she continued to study Tuina, Herbs and Nutrition, while maintaining a balanced lifestyle taking care of her daughter and herself very carefully. She also started doing yoga because her back had become more and more stiff, causing a lot of pain. The car accident was continually reminding her that she needed to move, otherwise she would be back into a wheel chair. During this time, while working with her patients she also became very aware that MOVEMENT is one of the important components of the healing process. Her patients also started to ask for yoga lessons, so she got certified as a Yoga Teacher and started conducting Yoga workshops. Liana was very interested in the energy aspect of yoga, Meridian yoga, and Therapeutic yoga. While living in Antwerp, Belgium, she was a member of the biggest Yoga school called ‘Antwerp Yoga’, which is, surprisingly, one of the best places to study REAL yoga. All the top world’s teachers teach and practice there, such gurus as Rusty Wells (Bhakti Yoga), PetrosHeffenrichter (Jivamukti Yoga), Gurmukh (Kundalini Yoga), Nancy Gilgoff (Ashtanga Yoga), KatizaSatya (Ashtanga Yoga). But her path was still to be challenged, and life gave her some more tough lessons. In 2001, in her early 30’s, Liana had another near-death experience when she drank a beverage, which caused anaphylactic shock. Liana’s vocal cords became so swollen, that she stopped breathing. At that moment she fully realized, that food CAN kill. Luckily, she was not so far from the hospital and the emergency staff saved her life. She did not have any allergy problems after this accident until 2011, when allergy flared up again with a very severe allergy asthma attack. 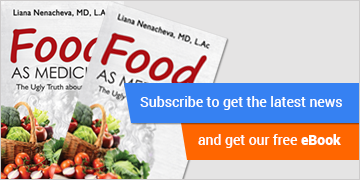 Liana had been already studying Nutrition and Macrobiotic therapy and applied this knowledge in her life and for treating patients successfully. However, this asthma experience brought her into a very deep awareness of the energy of her body. She thought she was healthy, eating healthy food and leading healthy lifestyle, but then she realized there was a whole lot more to know and understand. She started looking for new ways to live fully in this deeper level of wisdom. At the age of 45 Liana realized she was no longer willing to endure Belgium’s humid climate and polluted air, and that her very busy Holistic Practice was really harmful for her. Her Chinese doctor advised her to move, to find sunnier and dry climate. So she moved to Bali, Indonesia, and set up her Holistic Wellness practice in the magical town of Ubud. Here in Bali, Dr. Liana likes being able to help people from all over the world. It is a totally different approach than in Europe. In Antwerp (Belgium), most of her clients wanted her to ‘fix’ them. In Ubud, however, people are open to healthier, natural therapies and tend to want to change themselves, they are more open to understanding that many problems lay within their control, and that a healthy lifestyle and the food they eat play substantial role in their overall wellbeing. 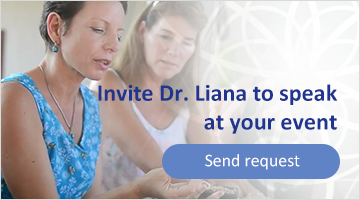 All the time Liana’s clients, students, friends, and even her daughter have been asking her to share her knowledge and medical proficiency, which has become very broad. 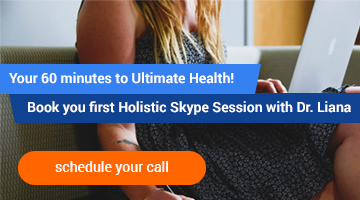 Liana has been studying and working for 30 years now, so she started to channel this collective knowledge and wisdom into “The Living Wisdom Academy” Online Wellness Education, “Whole Life Detox Bali” and into her books, courses and retreat programs. Liana has never had an easy life, however, she says: ‘My life is my best teacher. The Universe also gave me the best teachers and masters on my way and showed me my Tao (or Dao, Chinese concept for ‘way’, ‘path’, route’ – author’s note). My life gave me a lot of different and adverse experiences to help me understand ill-health, recovery and wellness from first hand experiences. I treat my patients with full understanding of what it means to be a very sick and unhappy person who now has been walking along the path to wellness and joy. I sincerely want to share my experience, knowledge, my tears and my happiness so people can take a part of it and then choose the part that they need or want to have, the part, that helps them to make a choice to be happy, healthy and live fully’.